The Oxygenator Live Well System & U2 Pro Formula Wrap. Closing out last season... It was an okay season, but nothing to get excited about, well except for going to each event. I look forward to a more successful season as we are nearing the beginning of season of tournaments. My status is currently down for recovery of a needed surgery. Looking forward to getting back on the water as soon as possible and to a great season. I want to thank all of my sponsors for their support over the last 20+ years and I look for to their continued support and our successes in the coming season. It's been a long time coming. But after 2 shortened seasons in a row because of health issues I finally got the doctors OK to get back on the water. I have to thank God first for the healing and for having a great wife who has supported me through this all. And of course all of my sponsors who understood and patiently waited for me to get healthy. And of course my Team partner Chris Kremer who kept the Team spirit alive for us while I was down. 2014 has been a wild ride! I haven't posted for a while....2014 turned out so far to be a crazy year here. Have spent very little time on the water this year so far. Started out having to deal with a nagging back issue and ended up getting very sick from an bad reaction and hospitalized because of one of the medications the doctor prescribed. I don't think I have been so sick like that in my whole life. Well, just when I thought I'd slayed those Zombies....stuff hit the fan again. Out trying to be a good husband on my Brides birthday....shopping for something special to cook her for dinner...I ended up blowing out my right shoulder....again. Nearly ten years since it was repaired with no problems and just like that gone. In a, seemingly easy thing...trying to move something it just went. Having been there before I knew instantly what had happened. So, there I was, in the grocery store...a cart full of goodies...in a lot of pain and no right arm. Managing to get to the check-out was an experience...but then trying to put everything in my truck and then trying to figure out how I was going to get in was even more fun. Well, I did manage to get home...walked in and told birthday girl the good news and grabbed an ice pack and became a couch potato. A month later now and after the MRI I'm just waiting for the doctor to tell me how bad the damage is. It will need repaired and I'm sure several months of rehab....will end my tournament season and take me into the start of the next season before I am ready to go. I hope 2015 is a better year! Good Bless America and remember to support and defend your Second Amendment Rights! Well 2013 is going out with a blast! Blast of cold air that is. Looks like it got pretty nippy last night. Happy New Year everyone! Tight lines for all in 2014! Well, the 2012-2013 tournament season is over for me. The 2013-2014 season is right around the corner. And what an end it was. My Partner and I qualified for the Total Bass Addicts 2 day Championship at Roosevelt Lake. Got up to the lake 2 days early for time to pre-fish and get ready. My pre-fish didn't go as well as I had hoped but I have a lot of time on Roosevelt Lake so I was confident my partner and I would do well. 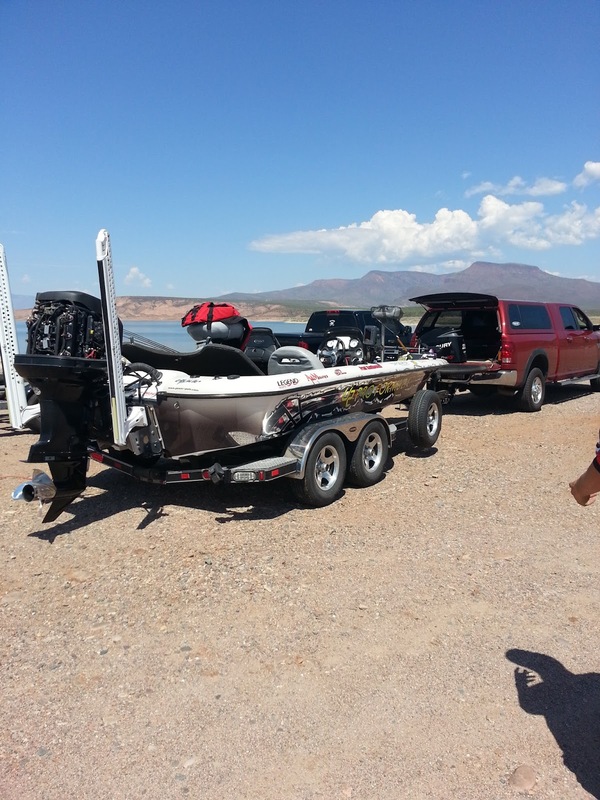 Well we fished the area and trolled around through a few neighboring coves and beat a lot of water. About 9:15 a.m. we decided to make a move to another location. That's when things got interesting. I fired up the main motor and let it warm for a minute and took off! I just love fast hold shots...and my Legend Boat is very fast out of the hole. Having come to plain, several seconds later I heard a loud noise and came to a stop...then a very bad noise of a main motor running rough. Bad thoughts!!! What the heck just happened.....wondering what just broke.....first I trimmed the motor up to see if the lower was broke...it all seemed to be there, no holes or cracks.. then we pulled the cowling off and I laid over the motor to see if I could find some sign of trouble. OMG! The motor shot one of the plugs clean out of the plug hole and there it was dangling from the plug wire. WOW! what the * just happened! While my partner kept fishing I attempted to reinstall the plug in the head. Being Mr. organized, and having cleaned up my gear I forgot to put my tools back in the boat. What now? I did not want to run the motor with a loose plug and either blow it out again or run the cylinder to lean so I figured I had only one choice and that was to troll back to the dock and try to find someone who had a plug wrench. You can't make this stuff up.... Off we went with the trolling motor on high and my partner says. 'well at least we have a really good trolling battery!' I responded.... and not a minute later the trolling motor shut down. Now what? Well we finally got some power back after finding a circuit breaker blown.....but we only bad 12 volts of power going to the 36 volt trolling motor. So as you can imagine with the dial on high we were moving at turtle speed and we were still a mile away from the dock. And!! its 105 degrees, humid and very sunny with almost no breeze.... brutal! So far, no known damage other than pride. So far all is well...trolling motor, battery and main motor all survived and boat will see the water this week for a test run. And hey...we got a prize for the least amount of fish weighed on day one! Who would have thunk! Thanks to my Bride and all of my sponsors for your support and the opportunity to use and promote the best products available in the water! Thanks Kevin for your hours of unconditional support over the phone! You are a great guy, sponsor and friend! Thanks Chris...was a great season bud! Another tournament season in the books. Well, almost. Just finished the Total Bass Addicts Summer night series tournaments. Had a great time caught a lot of quality fish and finished the last tournament with a 6th place finish with a 20.71lb bag and a 5.05 big fish! Qualified for the championship in September....looking forward to a great tourney! Some great news this week for the 2013-2014 season... Joining IROD fishing poles and Picasso Lures Pro Staffs. These are great products and I look forward to promoting and using them this coming season. If you want quality lures and out of the park rods, please check them out! I am proud to announce my affiliation with two companies. Lithium Pros - Lithium Batteries. http://lithiumpros.com/ and Danny Rogers of Stealth 1Charging http://www.stealth1charging.com/ . Kevin Bennett and his crew and the Lithium Batteries are top notch! By far one of the most impressive products I have ever used. I started looking at the option of using lithium batteries a few years ago when they were making their way into professional bass fishing. After watching a few lithium battery companies and reading reports from some of the top Pros in the country I was convinced that changing to lithium was a smart move. Researching once more I decided that Lithium Pros was the product I wanted to use and be involved with. 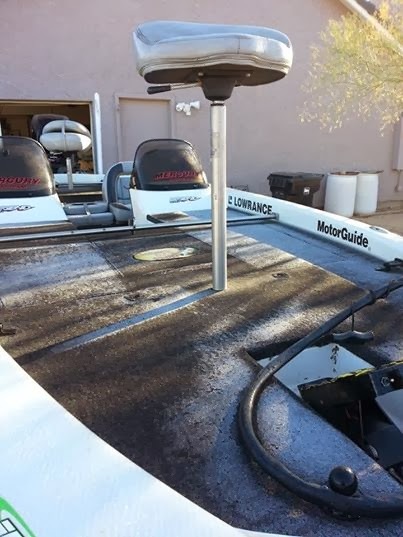 Reeling forward.... After recently installed my 36V Lithium Pros battery to power my MotorGuide Digital 109 trolling motor I can say that this battery is just amazing! Having removed 3 Group 27 batteries weighing approximately 60lbs each and installing 1 Lithium Pros battery weighing slightly under 29lbs and just slightly bigger that 1 Group 27 battery. It even fits into the same battery tray! Can you see where I'm going here?...just the weight saving alone is astronomical! A whopping 151lbs! GONE! Having coming from a drag racing background...for those of you who understand horsepower vs. weight...in the racing world that is means added performance, faster times, faster WOT speeds and added fuel economy. If you think that all....in bass fishing there are even more added benefits. But then add, faster charging cycle times, longer battery charge life, superior reliability and in a bass boat.....faster hole shots....and I do mean faster; increased WOT speeds, better trolling motor performance with increased time on the water with no worries after being on the water working the trolling motor hard all day of running out of power. And yes there is a charging system change you may have to make.. Unless you have a of Stealth 1 Charging system as I do but then there is just a small upgrade required and you are good to go. I needed to make a charging system upgrade more than a year ago to my Legend bass boat. My boat sponsor, Legend Boats, put me in contact with Danny Rogers of Stealth 1 Charging. 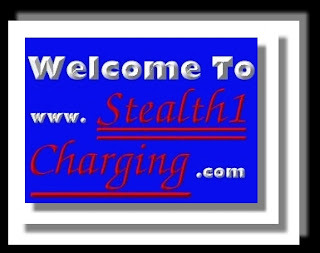 After doing some research again and talking with Stealth 1, I purchased and installed a Stealth 1 charging system. Friends, this is not your run of the mill charging system. This is the real deal! At first I have to say I was intimidated by the system. It does not fit the stereotype picture of a black box charging system. There are 2 boxes, one DC and one AC and then optional features like an emergency switch that can pull 12v from your trolling motor batteries should your main battery go down. Of course...I can't see that happening using a Lithium Pros battery for your main motor cranking battery. If you have spent enough time on the water....we have all sat down and turned the key and felt the panic of no main motor start with minutes to go to weigh-in! Fear no more with the turn of a switch! Well having an aviation electronics background as well I jumped in and installed the system. After the install was all said and done....it was an easy installation. Stealth 1 has been working with Lithium Pros for a few years and has developed a compatible upgrade to the Stealth 1 that complements the Lithium Pros battery charging requirements. Just absolutely mind blowing performance! Just a guy who has been blessed to live in the greatest counrty in the world, have a great family, and to live in this great nation, The United States of America. Thankful for those who gave all and for the suppot from family and from my sponsors and to be free to enjoy doing the things I love to do. Thank you! U.S Army Veteran. Two Smallies caught at Havasu. One on the right was a Smallie/Largemouth cross. She went 4.04lbs. I caught her during prefish and again during the tournament two days later right off her bed.